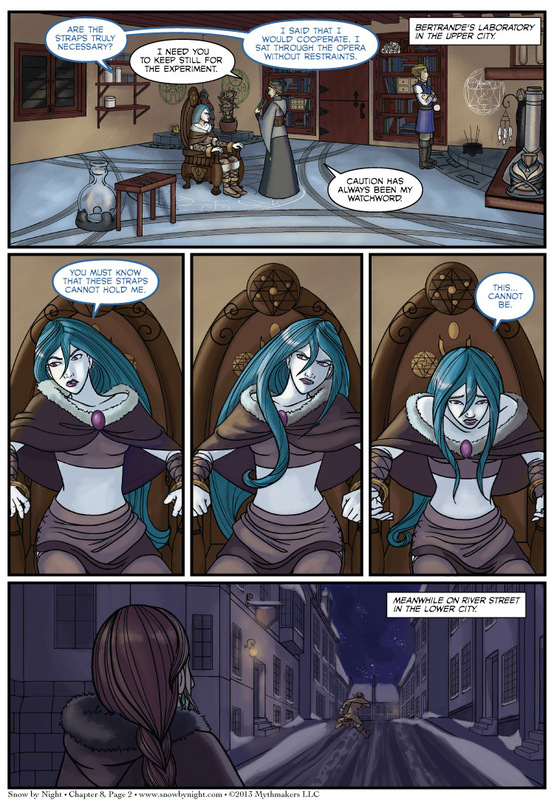 Bertrande and Jassart trick Snow-by-Night into the chair in Bertrande’s laboratory on Chapter 8 Page 2. Bad things will come of this. To see a hint of those bad things, please vote for Snow by Night on Top Web Comics. I’m tempted to make Snow-by-Night’s comment into a button. Maybe “I sit through opera without restraints.” Or maybe “Opera without restraints.” Not sure yet. I’m still playing with the wording. We will be taking our holiday break from Dec. 23 through Jan. 3. There are a lot of holidays in there and the team will be spending them with our families. So there won’t be any pages or almanac entries during those two weeks. We’ll resume on Jan. 6. During that time, I’d be happy to post any fan art. If you’re an artist, think of this as free publicity. I’ll put your art up on our landing page and give the link to your portfolio/website/webcomic. Check out some of the previous work done as fanart on our Extras page. A little bit of legalese. 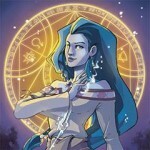 If you submit fan art to Snow by Night, you are granting Mythmakers a limited license to display the art on our webpage. You retain all other rights to it. In fact, Mythmakers will give you permission to sell the fanart, even though it uses our characters, as long as you include a link to our website on the art itself. The link can be small and unobtrusive as long as its legible. If you previously submitted fanart to us or participated in Art Contest earlier this you, this permission retroactively applies to you too. The Spider Forest webcomic of the week is Cooties. They’re in space at the moment. Yes, teenagers in spaaaaaaaaace! Webmaster here to pop by and say thank you all for your comments on the last post! I’m working on tweaking the speed, since that was mentioned as an issue, but in the meantime I’ve made some easy fixes. I removed the handful of bad references in the code that were trying to cache broken links. I’ve also created a comic page that you can bookmark if you’d rather have the latest Story page bookmarked instead of the index’s landing page. As always, if you ever have any suggestions for us, please let us know! Thanks are due to YOU for being awesome, Webmaster! Keep up the awesome work! Thank you so much for the link to the comic page! As much as I’ll miss the updates, I’m glad that you prioritize family and friends. Have fun, make great memories, and we’ll pop in every now and then to enjoy the fanart! Thank you, Greg. Fair warning though. You’re probably going to yell a lot in this chapter. Thanks for the warning. My wife wants to know how she’ll tell the difference, though…? ha, i literally only just noticed she doesn’t have a belly button XD nice touch. I will probably make a few enemies right here, but I need to say my piece. Having nearly frozen to death once, and having seen a man frozen to death, I have limited sympathy for Snow. I think she’s been looking down on the others at many points, and if Bertrande can pound a bit of humility into her and get enough alchemy to stop the next plague, why not. I don’t see Jassart as the beating-deserving or death-deserving villain some want him to be. I see him as a thief wanting out of that dangerous life, which is understandable. He doesn’t know, or like, Snow. Both he and Mathilde agreed that this is probably just a whim of Blaise’s, of which he’s had many from what they said. Was he supposed to let go of a possible way out of a dangerous life for a friend’s mere whim? Blaise is likeable, but acts like a child most of the time. People are angry that Jassart isn’t considering Blaise’s feelings, but has Blaise considered Jassart’s so far about this? No. He’s no better. In fact, his childishness at times make him look rather worse. He needs to get his act together. As for Mathilde, she betrayed someone she’s known for a long time for a spirit she barely knows as far as I know. Not big in my book. So here it is. Yeah, I know many won’t agree. That’s perfectly understandable. It’ll rub some the wrong way. I’m sorry about that. But I won’t go for a simplistic ‘Blaise = Right, Jassart = Wrong’. Too simplistic, and it would diminish this really rich world. I understand the other stuff tho… I personally don’t hate anyone in this comic, they all play off each other really well and have their good/bad points. If Blaise so easily makes Jassart go from ‘best friend’ to ‘enemy’ (come on, she’s a crush, and a silly one at that given that she is, you know, a spirit made of snow and ice, its not like anything meaningful can truly happen), then I have to wonder how Blaise has survived this long. I personally think he’d get over it eventually. I guess I could understand how you feel about Snow due to what has happened. But I don’t really think she needs anything to be fixed, as with the humility part, we also have to see it from her view, she looks down on others, but maybe because of the life she was leading at first, she was a spirit that everyone feared, except one man, she had no one really. She had no one to really learn from but one man, so she may expect a lot from people who can only offer little. I mean if I made a deal with people who said they would find my heart as long as I helped them, damn, I’d expect a lot too. I believe she only needs to be sat down and spoken to, and taught. I certainly like every character in this comic, so I don’t believe there is really a Blaise = Right and Jassart = Wrong, because when I think about it, they’re both right, Jassart believes this way will be the only way to actually help his friend, maybe it’s not the best idea to come with, but it’s right of him to want to help his friend, Blaise is also right for wanting to help Snow since they did after all make a promise to help her, and it’s understandable of him to want to help her even more since he loves her. And with Mathilde, I wouldn’t say she betrayed Jassart, in fact I think she just doesn’t want anyone getting hurt, because Blaise is her friend, even though they don’t really act like it, they still are, and Jassart is her lover. And maybe she sees Snow as a girl/spirit who only wants to have a heart so she can understand how others feel, especially how that man felt. If Blaise does save Snow, I have an idea, that MAYBE… MAYBE, Snow will possibly feel something, maybe not love, but thankful, and happiness, that she has someone like Blaise to help her. I could be wrong because at the same time, Snow could be mad at both of them due to the situation they both put her in with Bertrande. I don’t see how telling Blaise this way – likely getting him extremely stressed at the very least, which will likely lead to him and Jassart having a verbal and perhaps physical fight – is a good way to not let people get hurt. Likely, what she did will hurt both men in some way. I believe the idea of Snow being used to cure the next plague will hurt even more than Jassart and Blaise getting into a physical or verbal fight, and Blaise seeing Snow missing, (that’s if something does happen to Snow, and if he never finds out about what happened to Snow) he will be extremely stressed, most likely depressed, and just really heartbroken. Then of course if he does ever find out what happened to Snow, there will most likely be no more Jassart + Blaise. Which as well could be worse than Jassart and Blaise getting into a fight. Plus, we don’t really know what Mathilde told Blaise, of course it’s assumed she said Jassart took Snow to an alchemist for those reasons, but she could have just said Snow is in trouble and under the hand of an alchemist, and not mention Jassart at all. It’s unlikey, but possible. If he knows about Jassart being involved in the mess Snow is in now, he might forgive him later on. Of course I doubt Jassart and Blaise will be broken up, they’ve been friends/partners for quite awhile, if they do separate, they’ll probably just share paths again. Once again, I could be wrong about this all, but it’s just my take. Tricking Snow with a false promise and then leading her to an alchemist to have her undone? Yeah, I’m just going to chalk that up in my Big Book of Evil as “yes”. It’s self-serving in the extreme, and the “bros before Snows” argument is self-serving as well. Not that I have a problem with characters being evil or self-serving. I’m just not going to sugarcoat their actions. “My friend no longer hangs out with me. This is all fault of the girl he has a crash on. You know, the one that I used and deceived. This has nothing to do with humongous amount of money i get for selling her or her forcing me to keep the deal. PS. Splendid work. This commic, dammit, is: The Art.